(L-R) Kimberly Scott as Cynthia, Kevin Kenerly as Brucie, Tara Mallen as Jessie and Johanna Day as Tracey. Photo by C. Stanley Photography. Playwright Lynn Nottage must be gearing up for a second Pulitzer Prize. Her latest production, Sweat, a gritty, hard-driving play has all the elements of a masterpiece. Skillfully directed by Kaye Whoriskey the story plunges us headlong into the underbelly of an American drama in a story centered around factory workers whose jobs are endangered by the implementation of NAFTA – – the controversial trade agreement that forever altered the nation’s manufacturing landscape and destroyed the economic livelihood of thousands of workers and the social fabric of their cities and towns. 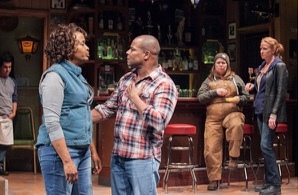 In Sweat, Nottage illustrates the fallout of those decisions by focusing on a town whose families have worked at the same factory for generations. The plot, which toggles between 2000 to 2008, shows what befalls the town’s citizens as their rights and salaries are diminished and their unions are rendered defenseless when corporations take production to Third World countries. In researching the story Nottage lived among those disenfranchised workers in Reading, PA, one of the areas of the country most affected by NAFTA. 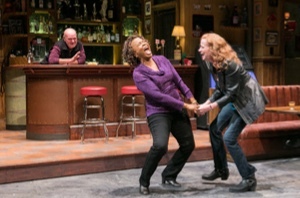 (L-R) Jack Willis as Stan, Kimberly Scott as Cynthia and Johanna Day as Tracey. Photo by C. Stanley Photography. Stan (Jack Willis), a former millworker, now on disability, runs the bar where the locals meet to nurse their drinks, mark their birthdays and wallow in their miseries. It serves as a part-time living room for factory working mothers and their sons like Tracey (Johanna Day) and her son, Jason (Stephen Michael Spencer) and Tracey’s best friends and co-workers on the factory floor, Jessie (Tara Mallen) and Cynthia (Kimberly Scott) and her son Chris (Tramell Tillman). John Lee Beatty’s set design of the down-and-dirty local bar is spot on with its neon beer signs and rundown furnishings. As they struggle through these issues, Tracey and Cynthia learn that a management job has opened up at the factory, compromising their friendship as they vie for the same position. At last after being locked out and walking the picket line for nearly two years, the friends are offered an ultimatum – – take a pay cut and lose your benefits or lose your job – – a scenario played out across the country as corporations sought to bust the unions. “They squeeze us like a sponge,” Tracey indignantly howls. 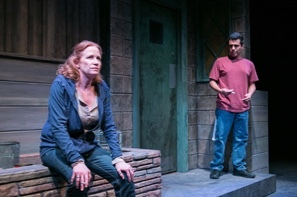 (L-R) Johanna Day as Tracey and Reza Salazar as Oscar. Photo by C. Stanley Photography. In a twist of fate, Stan’s barback, Oscar (Reza Salazar), a solicitous young Hispanic working at minimum wage, breaks the line to take a job at the factory and the situation turns uglier. It is a gut-wrenching, darkly humorous and powerfully visceral story that reveals the suspicion, hatred, racism and jealousies that arise when workers looking for explanations for their cruelly altered circumstances seek to spread the blame. Performed by a seasoned cast who convey these raw emotions exquisitely. Brilliantly acted and highly recommended. Through February 21st at Arena Stage, 1101 Sixth St., SW, Washington, DC 20024. For tickets and information call 202 488-3300 or visit www.ArenaStage.org.